This is a short reflection on a new Working Paper I’m an author on. The paper is largely the work of Jason Potts with contributions from myself, Lucy Montgomery, Ellie Rennie, and John Hartley. The moment that I decided it was time to move on from PLOS is crystal clear in my mind. I was standing in a room at the South of Perth Yacht Club, giving a short talk on my view of the political economics of journals and scholarly publishing. I’d been puzzling for a while about a series of things. Why wasn’t the competitive market we predicted in APCs emerging? What was it that made change in the research communities so hard? How do we move from talking about public access to enabling public use? And how do we decide where to invest limited resources? What is thing we call culture and why is changing it hard? The people working on a program they called Cultural Science seemed to have some interesting approaches to this, so when they asked me to the workshop I gladly came. It was a small group, so I was speculating. What if instead of treating knowledge as a public good we acknowledged that it is born exclusive? Knowledge can’t exist with just one person knowing, it must be held by a group. But it starts exclusive – held by the group – and when we choose to communicate it, publish it, open it up, translate or explain it we invest in making it less exclusive. 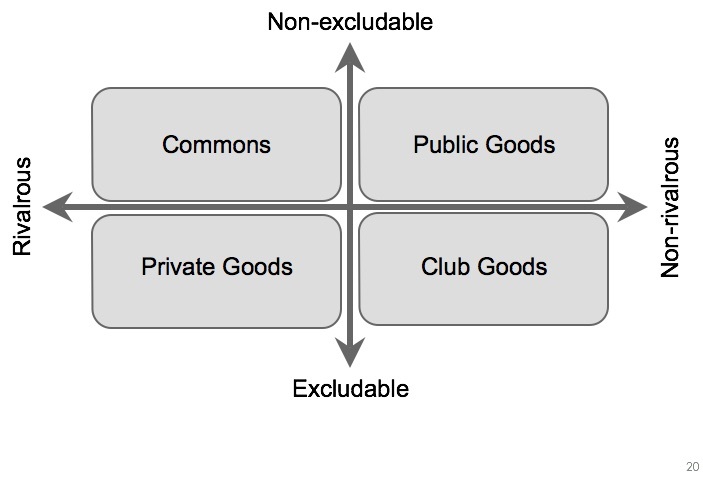 I pointed to the exclusive – non-rivalrous quadrant of the classic goods diagram, labelled “toll goods” and said that the shift from a subscription journal (toll good) to Open Access was just one example of this kind of investment, that all of this “public-making” takes us towards the public good quadrant but that we never quite reach it. I might even have said we could do with a better name for that bottom right quadrant. Jason Potts, who was the other panelist in the session spoke up to say “…it has another name you know…they’re called ‘club goods'”. That was the moment – we’d been talking about communities, cultures, economics, “public-making” but it was the word ‘club’ and its associated concepts, both pejorative and positive that crystalised everything. We were talking about the clubbishness of making knowledge – the term “Knowledge Clubs” emerged quickly – but also the benefits that such a club might gain in choosing to invest in wider sharing. John Hartley and Jason had laid much of the groundwork in connecting groups, culture, economics and communication in their book. What we might now have was a frame in which to interrogate why these clubs (research groups, disciplines, universities, but also journals) do what they do. Pretty much everything since then flowed from that point. I’ve been frustrated for a long time with traditional economic analyses of scholarly publishing. They don’t seem to explain what actually happens, and fail to capture critical aspects of what is going on. The lens of club economics seems like it might help to capture more of the reality of what is going on. Jason has subsequently worked through this concept, laying out the issues and a new working paper is the result. This is at the idea stage, there is much detail to be worked out, but what the club formulation does is place group dynamics at the centre of the frame. Treating articles as simple supply and demand objects (which they’re not) at equilibrium (which they’re generally not) within the background of some sort of market (which the research community isn’t) leaves the important pieces, the messy human interactions, prestige and reputation out of the equation. I’m not going to claim we have the answer to solving that, but we do at least have a new way of looking at the questions. A very interesting piece. 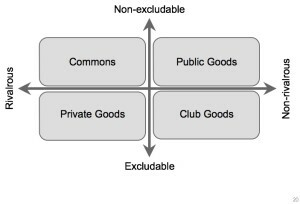 I have been promoting (for too many years to count and so far with little success) a related ‘guild’ model which shares an underlying rationale with some of the ideas you discuss. The knowledge club is already well known in the form of a scholarly society. In a nutshell, this guild model proposes the allocation of a significant proportion of the membership dues of a learned society to a publication fund which can then be used to support a digital or even print publishing service. Membership of the society (or club) confers a benefit, for example waived or significantly lower APCs for accepted manuscripts. Although not all members of a society are at the same career stage or have similar drives to publish, the wish to support the scholarly publishing for the good of the community might well result in those members who are not actively publishing being pleased to see their dues being used to support those who do need/wish to publish. Publication in the society’s journal or series should not be limited to ‘members only’, but content quality assurance via acceptance for publication should be controlled by the society, for example by peer review under society appointed editorial supervision. Where to publish one’s work – in the membership supported journal, in a rival society journal, or elsewhere? Academic independence on where to publish is not compromised by this although a migration between societies that provide the most appreciated benefits might be expected. Societies facilitate many other roles in research including conference and meeting organisation, subject/field representation, accreditation and more. However the dissemination of reviewed and citable content can certainly be a central service and a motivation for membership. Reliance on existing income streams from journals to support other activities can make it hard to see the benefit of changing the model, but a newly formed society may be able to adopt a more experimental approach from the start. funds, etc. but perhaps there is also an opportunity for change.